This winter I wanted to make myself a new crochet infinity scarf to wear with my new coat. After searching the internet for crochet infinity scarf patterns, I started to find some really unique ones that I loved, and wanted to pass along to all of you! The infinity scarf is a scarf made into a continuous circle, often one that is created long and you can loop over your neck at least once to control the length. These are great scarves that can be made with bulky yarn for winter wear, or made lighter to wear in the spring and fall. Here’s 20 scarf patterns for you to enjoy! Infinity scarf using the primrose crochet stitch. Cute, chunky scarf pattern. I love this stitch! This would be a great scarf to crochet for sporting events in your school’s colors. The edges of this infinity scarf are unique and gorgeous. I can’t wait to make this one. Infinity scarf in a mosaic pattern. This would be a great colorful scarf! This lattice design pattern is beautiful. It looks like lace and like an easy pattern to make a few scarves with. This scarf looks warm and cozy for winter. A bulky scarf with a fun stitch. I would probably make this one in a neutral color to go with anything. I love the simple look of this scarf, and the color of yarn she used to make it is amazing. I really like the location of the stripes in this scarf. I can’t wait to go search for some unique buttons to put on this one. I really like the length of this scarf and the lace pattern. Looks great in a grey color. This scarf looks great hanging low or doubled over. I love the pattern. This scarf looks so warm and comfortable. The lace pattern looks so delicate. A nice, warm and snuggly chunky scarf pattern. I’m absolutely loving the crochet plaid stitch. It’s been fun to crochet this pattern, and I can’t wait to make one of these scarves. A cute scarf in just four hours? I think so! That’s definitely my kind of project. This would be another cute scarf created in team colors for events, or a grey and white. A reversible scarf made using the plaid stitch. The dual color of this scarf is what makes it look a bit unique. Very pretty! 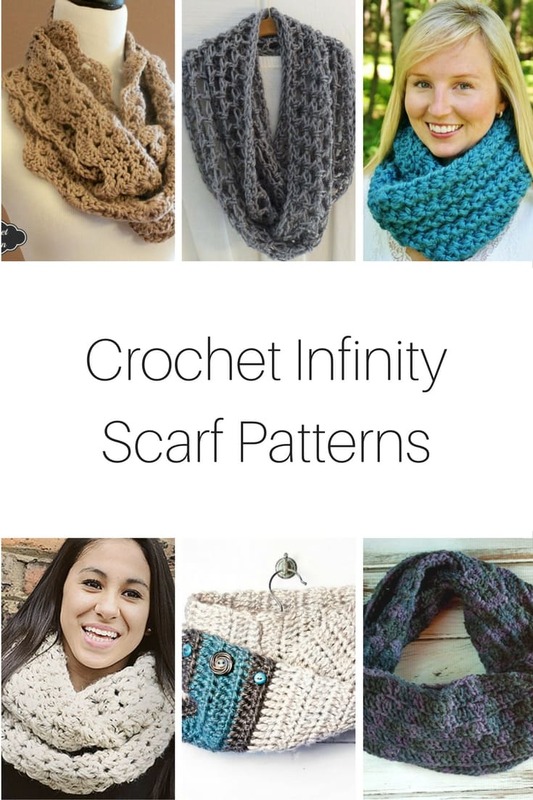 Which of these infinity scarf patterns do you think you’ll make next?